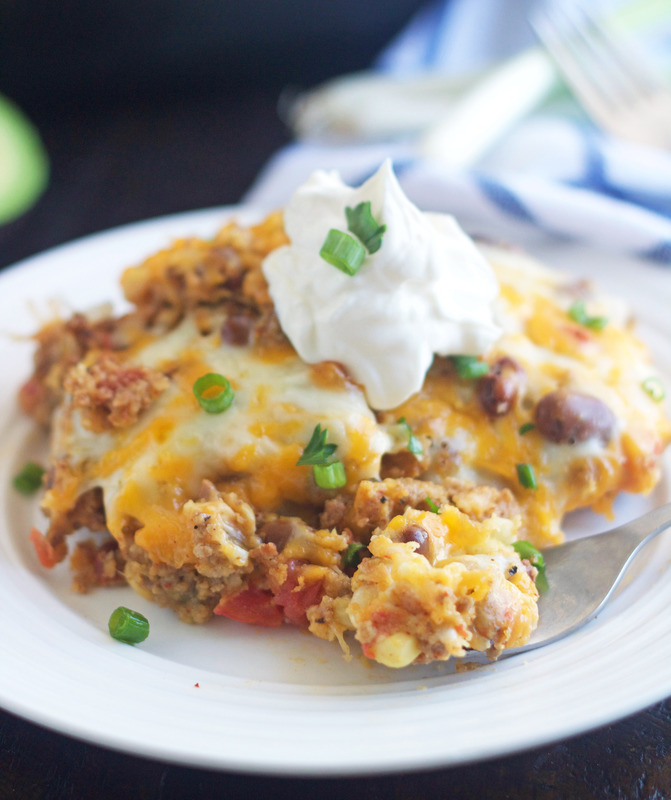 This Slow Cooker Tamale Pie is hearty, filling and absolutely delicious. It’s the perfect weeknight dinner and will be loved by even your pickiest eaters. It’s really cooled off here and gotten down to the mid 30s a few nights and I’m freezing! It is warming back up into the 60s during the day, but I’m still cold and wondering how in the heck I’m going to get through winter. It’s going to get sooo much colder than this and I’m already dreading it (lol!). 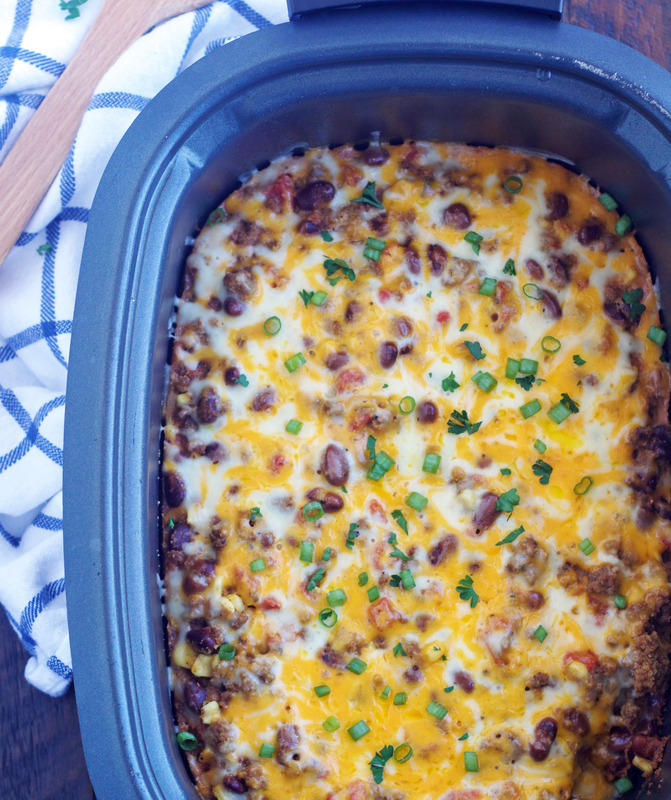 I guess I’ll just have to rely on warm, comfort food like this Slow Cooker Tamale Pie to warm me up. You guys, this stuff is so, so good. Every single one of us devoured it. If I’m being honest, I could have easily eaten the entire slow cooker of it all by myself. I love how simple this is to make. You do have to brown your ground beef first, but after that it’s one of those mix and dump slow cooker recipes. . .so easy peasy. 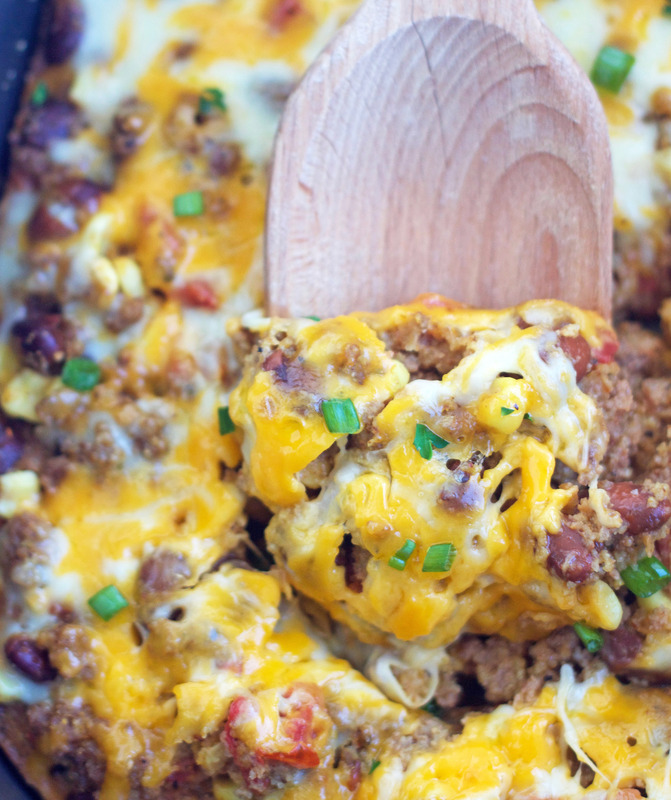 Most tamale pie recipes I’ve made or seen have the cornbread layer on top. This recipe is a little different because the cornbread layer of this recipe is mixed right into the pie. It makes this dish so hearty and gives it such good flavor. It may not look as pretty and fancy as those recipes with the layer on top, but I promise you this stuff is absolutely delicious. It’s comfort food at it’s best and is the perfect thing for these cooler fall nights. This might just look like your old run-of-the-mill casserole. Trust me, it’s so much better than it looks. The options for toppings are endless . . . sour cream, green onions, olives, tomatoes, avocados, salsa, cilantro, etc. You can of course just eat it as is and it will be just as delicious. I do really, really recommend sour cream though! I think this would be so delicious with a can of enchilada sauce added in as well. So I think I’ll give that a try next time I make this and let you know what I think. In a skillet, brown the ground beef, adding the onion and garlic. Drain the excess fat from the beef. Set aside. In a large mixing bowl, whisk together the cornmeal, egg and milk until smooth. Add the tomatoes and green chilies, corn, chili beans, cumin, chili powder, oregano, salt and pepper, mix well. Add the cooked ground beef and stir well. Pour the mixture into a 5 or 6 quart slow cooker, cover and cook on low for 4 to 5 hours or high for 3 hours. The last 10 minutes of cooking time, sprinkle the cheese on top of the pie and cover.